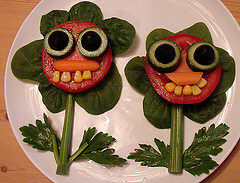 The term "vegetable" generally means the edible parts of plants. They are excellent sources of fiber, vitamins A and C, potassium, calcium, and iron. As a source of nutrients most of these herbaceous plants also contain a small proportion of protein and fat and their root supply us with carbohydrates. The yellow/orange colors of fruits are due to the presence of vitamin A as carotene. The green color of leafy is due to the presence of the green pigment chlorophyll. The chlorophyll is affected by normal cooking processes or changes in pH to olive green in acid conditions, and bright green in alkaline conditions. The red/blue coloring of some fruits and vegi (blackberries and red cabbage) are also sensitive to changes in pH. When pH is neutral, the pigments are purple, when acidic, red, and when alkaline, blue. These pigments are very water soluble. All of them are beneficial to our health and should be included in every person's diet. When it comes to make salads, these herbaceous plants need to be very well cleaned without be soaked in water. Soaking them in water leeches minerals and vitamins from them and reduces their value as foods. I coined the slogan "a salad a day keeps acidosis away." It is rare that a slogan is strictly accurate, but this one came as near being fully accurate as slogans do. It is true, however, only if the salad is of the right kind. Shrimp salad, potato salad, egg salad and salad covered with oil or vinegar will not answer the purpose assigned to salads. The word salad is from a Latin word meaning salt, and our salad vegetables are abundant sources of mineral salts in their most readily assimilated form. There is no substitute for green foods in our diet. It is important that these be taken, largely if not wholly, in the raw or uncooked state. 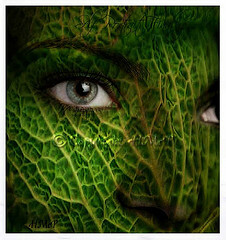 In general the green leaves of plants are our richest sources of organic salts (minerals), are rich sources of vitamins, are sources of small quantities of the highest grade proteins and are the best sources of chlorophyll, which, while it will not deodorize your breath and body, is essential in animal nutrition. Salads are not so important in the diet of one who lives largely on uncooked foods and whose diet is made up largely of fruits and vegetables. One who eats largely of flesh, cereals, legumes and other starchy and high protein foods has an urgent need for one or two large green salads daily. The widespread practice of cutting, chopping, and shredding salad vegetables and serving them with dressings of one kind or another cannot be too strongly condemned. Dr. Tilden used to advise his readers to make such a salad and then he would add that the salad should be "dressed with lemon juice, oil and salt to taste." If cabbage was the only vegetable to be procured, as at certain seasons of the year it often is in some parts of the country, he advised eating it in the form of cabbage slaw. The slaw may be dressed with salt and lemon or vinegar; or a sweet, sour dressing may be used; vinegar and lemon juice, sugar, salt, and a little sweet or sour cream." Both of these are bad dietetic practices and must be looked upon as concessions by Tilden to the popular taste. When vegetables and fruits are sliced, cut small, ground, shredded, or otherwise broken into small particles, so that the oxygen of the air gets to them, much food value is lost through oxidation. The longer they are permitted to stand before eating, after they have been thus treated, the greater is the loss of food value. The loss of certain vitamins through oxidation is especially rapid. Such practices are permissible only when feeding the toothless individual who is unable to chew whole foods. Then the food should be fed immediately after preparing, so that a minimum of loss through oxidation is sustained. The dressings added to salads are not incompatible with the salads per se, but they do interfere with the digestion of other foods. Acids used in the dressings interfere with the digestion of both starches and proteins. Oils added to the salad interfere with the digestion of proteins. 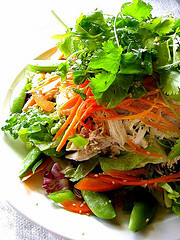 Whether cream is sweet or sour, its addition to the salad will interfere with protein digestion. Sugar added to the salad dressing inhibits protein digestion. Thus, while there is no serious reason why oil or cream may not be added to a salad when it is to be taken with a starch meal, it should not be added to a salad that is to be taken with a protein meal. Lemon juice and vinegar should not be added with either meal. There can be no objection to the addition of lemon juice or oil or both to the salad if a salad is to be taken alone as we often like to do, or, as often happens, the salad and a cooked green vegetable is to be eaten as the meal.